BeagleBone AI SBC features dual ARM A15 SoC with “EVE” AI cores #BeagleBone #TI #BeagleboneAI « Adafruit Industries – Makers, hackers, artists, designers and engineers! Via linuxgizmos.com, BeagleBoard.org unveiled a BeagleBone AI single board computer (SBC) with a dual Cortex-A15 TI AM5729 SoC that offers AI support via dual C66x DSPs and 4x EVE cores. The SBC has 1GB RAM, 16GB eMMC, WiFi, and GbE. When Texas Instruments announced its quad-core, Cortex-A53 AM65x SoC late last year, we wondered if it might power the long-awaited successor to the BeagleBone Black. We were wrong: longtime TI-linked open source community BeagleBoard.org has announced a BeagleBone AI SBC that instead uses a new dual Cortex-A15 Sitara AM5729 SoC. Yet unlike previous AM57x SoCs, such as the AM5728 that powered the BeagleBoard-X15, the AM5729 includes four powerhouse embedded-vision-engine (EVE) cores with AI capabilities. 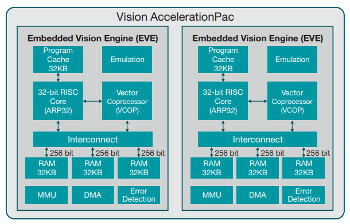 The EVE cores were designed by TI for automotive vision applications via a Vision AcclerationPac architecture. A TI white paper on the technology may be found in this white paper (PDF). The BeagleBone AI will offer BeagleBone Black header and mechanical compatibility, as well as a “zero-download out-of-box software experience.” Presumably, it will continue to run Linux and ship with open specifications. The SBC is aimed at “everyday automation in industrial, commercial and home applications,” says BeagleBoard.org. See the linuxgizmos.com article and the BeagleBone AI product page here.